Once you've got your templates all ready to go the next step is to put them to good use! Not only can and should you apply them to relevant profiles, but following that process you can also edit a student's payment plan to make individual changes, like in the event of a unique scholarship. So let's get to business! PROGRAMME AND CLASS — Select for which programme and class the payment plan is meant for. PAYMENT PLAN TEMPLATE — Select which pre-created payment plan template is right for the student. NAME — Write a name of your own choosing to specifically identify that student's payment plan. This will automatically migrate the setup of the template to the student's newly created payment plan, including sums and due dates. If no changes are required just leave as is and you're done! 😉 However, it's perfectly possible to edit the details if need be: for instance, extend a deadline, alter an amount, etc. Keep on reading to learn the ins and outs of browsing and editing a student payment plan! 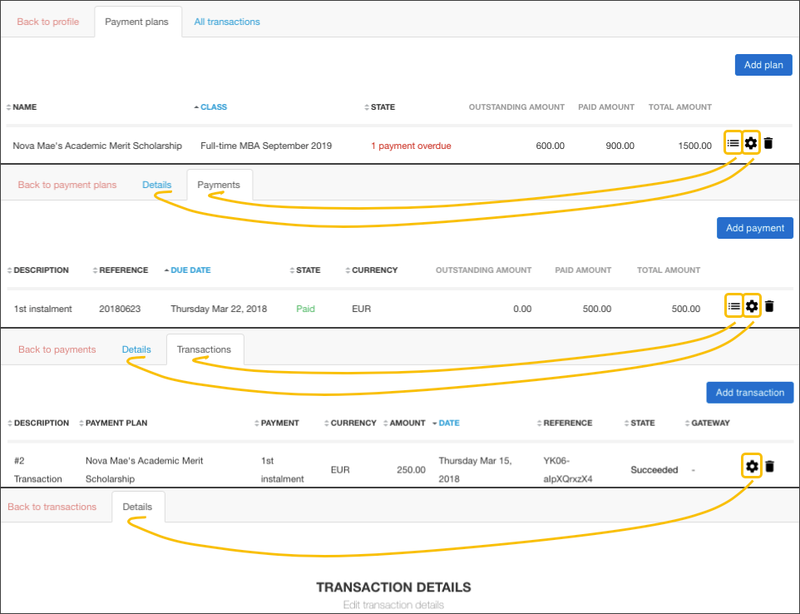 NEXT: Learn how to add transactions to payments! LAST UPDATED: August 21, 2018 at 12:02 a.m.